A little new, and a Giveaway! You are here: Home / giveaways / A little news… AND a Giveaway! A little news… AND a Giveaway! The past few weeks I have been doing a 30 days of Giveaways to celebrate 300k subscribers! Woohoo! Each day I post a giveaway on one of my social media sites, but today I decided to do one here on the blog. 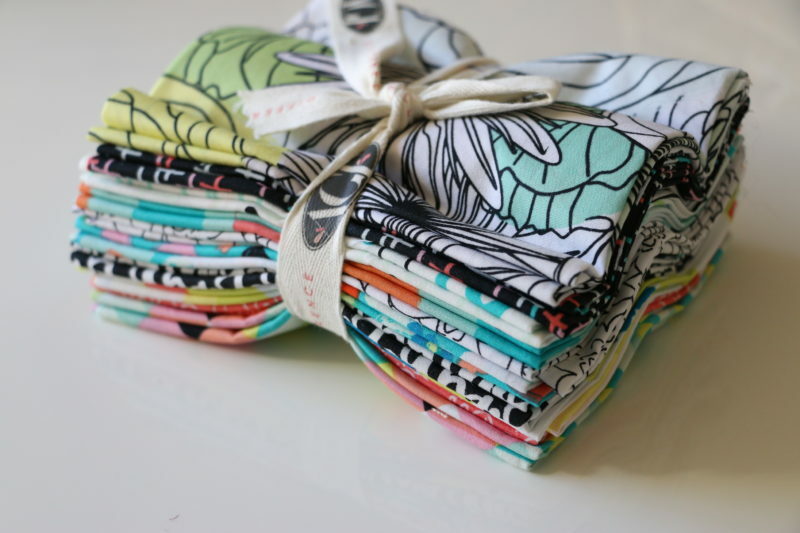 Today you can enter to win this adorable fat quarter fabric bundle! This fabric is by Art Gallery Fabric and called Here Comes the Fun fabric line by Sew Caroline. So bright and cheery yet modern too! I want you to leave a comment letting me know what sewing or quilting projects you are planning to make in 2017! 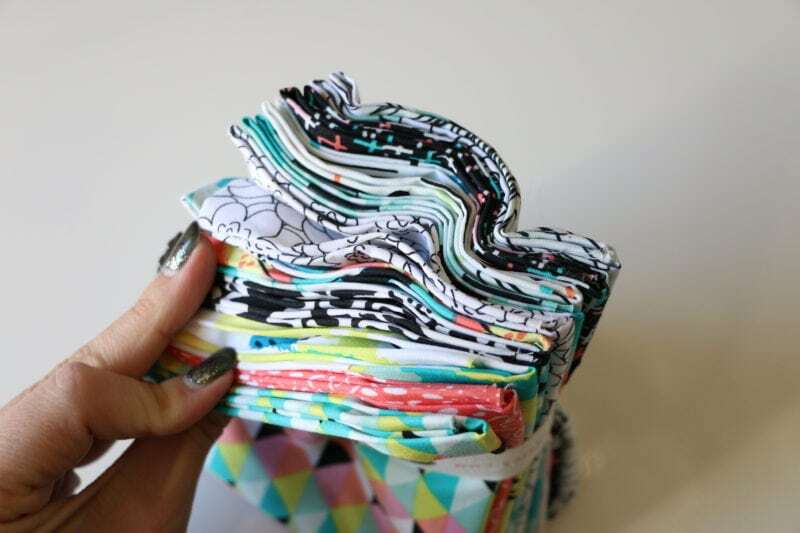 Sew Mama Sew Giveaway Day!! Fabric Gift Card! Love to make a baby Quilt for my new granddaughter! Melanie, what is a bingo bag? I am being asked to make one for a new mom, but I don’t know what it is. I tried searching your site, but no success. thanks for any info! I am still trying to finish up requests for your awesome zipper bag! Everyone loves it particularly since I made them in recipients’ favorite football team fabric! I’m planning on finishing up my jelly roll quilt that I just started a couple of months ago. Then, possibly trying a new quilting project if there’s time. Hi I am planning on finally using the jelly rolls that have been staring at me every time I open my stash closet! I have 2 each of 2 different fabric groups and actually, happily, found you by browsing the internet and you tube for ideas. Right now I’m things together for some quilted throw pillows- those fabrics in the giveaway are beautiful! My first project this year will be to make burp cloths (following your tutorial) for my first grandchild, arriving in March! I’m planning to make some giant floor pillows for my children this year and finish a quilt I started 4 years ago. I’d also like to sew some pillow covers, just watched your envelope enclosure pillow cover tutorial. Thank you for the inspiration! Hope to make something for my friend’s quilt show in a garden this summer. Making quilts for three of my Granddaughters. Have only been quilting for a couple of years. I really enjoy your videos on you tube! Making each of my 4grandchildren a quilt. They are ages 4to 9. Made them all baby quilts when they were born but now need bigger ones. Also want to make each of them a rag quilt. So many projects with so little time. Also wanting to do some wool projects. Wish me luck. As I’ve been cleaning out my closet and coming across some blankets my grandmother made and gifting crochet projects I have made, I have committed to making a quilt for our house which I can pass on later to my children. There are so many other projects I would like to accomplish as well in 2017. I am hoping to do more sewing in this next year. I’ve mostly just been making clock napkins and small fleece things for my grandchildren. Hope to branch out a little this year. For this upcoming 2017, I plan to make more pencil cases for my nieces and nephews. I love your tutorials and your blog! Trying my second quilt, a HST sampler quilt!! More gifts for friends. Hoping to make at least two quilts. I’m re-learning to sew after nearly a 20 yr break. I plan on making bags, wallets and pillows/pillowcases. These fat quarters would be great for those plans! I need finish upholstering my chair for my new sewing table that we cut a hole out of a kitchen table to make. Once that’s finished I can make make the rest of my flying geese quilt, my jelly roll quilt, and make my pj pants with some cool new fleece fabric I bought. I have time off now to work on it all. Yay. I hope everyone else’s projects get completed and I have big plans to finish mine. Hello! I am so inspired by your projects! 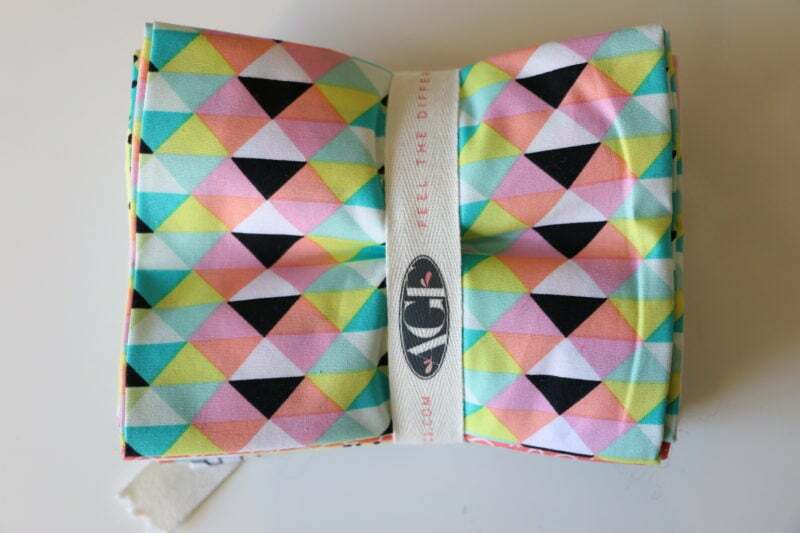 I can’t wait to attempt to make the boxy zipper pouch from your tutorial. So cute, and such a great gift! I plan on finishing my first ever complete quilt with your QAL. 🙂 And I hope to try my hand at sewing a few simple garments – pj pants and a girls skirt. But most immediately I have a notion to sew a flannel infinity scarf using Robert Kaufman’ s Mammoth plaid. Thanks for all these giveaways! Your flying geese quilt. Also the Rhapsody quilt by Anita Goodesign. I am new to sewing … I am excited and would love to try some simple sewing projects for the home . I plan to start with pillows covers and aprons . I’m going to make a One Block Wonder quilt!! This year I am planning on making my first quilt. Last year I bought the fabric I planned on using and started cutting my squares. Then I decided to get a bit more advanced than I probably should have and messed up. And I’ve just neglected the project ever since. In 2017 I am getting it done! Hey Melanie! I love your tutorials! I am planning on working on a quilt for my Husband. Also, I will be making baby gifts for two of my sister-in-laws who are both pregnant right now. I will be making more cloth pads as well for gals in places who need them. I am planning on quilting a large quilt for our bedroom! I have yet to make myself a quilt. I plan on crocheting A LOT more. Your videos have inspired me to crochet (never could’ve done it without you!). I also plan on making a few new quilts and finishing up a few in the making. Thank you for all you do! I’m attempting my first quilt (using the “quilt as you go” method) I’m looking forwarding to finishing it in coming months! I want to finish the quilt I started a few months ago, perfect my zipper pouch technique, and learn how to knit! I JUST got a Brother sewing machine for Christmas… I decided to make myself a new purse (I have bought two previously off of Etsy). I am a little overwhelmed-haven’t started yet, but I am really excited! I have already purchased your tutorial for the flying geese and I hope to venture to that after I complete a purse! Might try a simple frayed quilt first! I want to finish my fox quilt this year! You have inspired me to make my first quilt!!!! 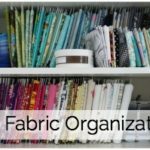 This is my favorite blog, and I have made so many of your projects!!! Right now I am on my 9th Messy Bun Beanie!!! Everyone wants one!! Happy New Year! Keep doing the wonderful work you do!!! You’re an amazing woman, and a inspiration to all your fans! I am planning on making baby bibs and blankets to donate! I am a dying breed…..I am in my 29th year of teaching Home Economics (politically correct is Family and Consumer Studies, but my college degree says Home Ec.) at a small high school in southern Oregon. I come from a long line of Home Ec. teachers, my grandmother taught at Oregon State, my mother in Portland. I lost my sewing program many years ago…very sad. Sites like yours are bringing back the love of sewing and crafting in a new and energetic way. You inspire our younger generation to explore the creativity hidden within them. You have inspired me to try challenging crochet projects I might never have attempted. This new year I will finish the free motion stitching on my queen sized quilt I started in 2016. I just had my grandmother’s 1941 Singer refurbished and I will use it to do the FM stitching. Thanks for all you do to bring the joy of sewing and crafting to so many. I am hoping to finish several projects that have been started in the last few years. Also, a baseball t-shirt throw quilt for my husband! Im planning on making my first quilt! I just got a sewing machine for Christmas and I can’t wait to try it out! I am planning on making 3 quilts including a t-shirt quilt. Also, I am planning on making things for around the house such as curtains, pillows, seat cushions, etc. I want to make some fun tote bags to cart around my crochet projects. This material looks like it would fit the bill! I am planning on making a rag doll and some cot blankets and pillows that match. My projects for 2017 are making 3 zippered pouches for my youngest grandchildren & 2 Crossbody bags for the oldest girls. I just started sewing & crocheting again after many years so I started a planner for my projects to increase my skills. I am currently working on your pattern for the beginner’s scarf to get back in the stream of crotcheting. I love your videos and tutorials. You explain & show steps so clearly. I love when you caution on how we can do errors. Thank you so much!! I am planning on making a rag doll out of my daughters clothes then some cot blankets and pillows to match. I’m working on a quilt for my first grandson, who arrived on December 15. He was expeced in January. I am new to quilting so I purchased your flying geese course so I will be making a quilt. I have the Fabric, I jut need to put together a pretty quilt in grays to represent Brain Tumor Awareness. I’m a brain tumor survivor! I am planning a quilt for my daughter in law. One for my grand daughter who just turned one years old. That’s all I have planned so far. I am working on a quilt for my daughter and a bunch of little items for gifts. Lots of babies in 2017!! I’m planning as my first quilt project the strip Quilt you did a video of a while back. Wishing you and your family a wonderful New Year. I am making a baby quilt for my first grandchild! I plan on making a clutch and a boxy zippy bag (as toiletry kit for male-college-bound graduates in their college cotton print) from your tutorials. Also I plan to make cute zippies for teacher gifts. May the new year be calming and creative for everyone! I’m from SASKATCHEWAN, CANADA. Please have more giveaways for International peeps. I just joined a Blocking the month club. At the end of the year I will put those blocks together. I plan on making some pocket pillow covers! I am planing on learning to quilt this year. My first quilt will be for my 9 month old granddaughter and my second will be for my newest niece (due 5/2017). I’m glued to your blog. I am planning on finishing my first quilt! I am planning to finally make a stock pile of items I have sold. I am trying to get ahead so I am not rushing as busy times, like Christmas. I am anning on completing the two quilt courses I bought from you 🙂 and sewing lots of garments with my African fabrics. Would like to make a shopping tote, several actually. No more plastic bags allowed in Calif.
Making more quilts and maybe a handbag or two. Working on my Modern Mashup quilt and hope to complete it this year. I am still working on a queen size patriotic quilt for the hubbs…..hopefully I will complete it soon. I have 5 projects that i am working on and hope to have them finished soon. I will be making my first full size Quilt this year for my mom! I am using Robert Kaufman fabric and I will including some pieces of her denim jacket from high school! I am not sure what I am going to sew this next year. But I would still like to win. What yummy fabrics! I have several projects planned. I have 2 Block of month quilts as well as several paper pieced projects, not to mention the garments I want to make! I have 5 qut tops I need to finish this year.. I have 4 more planned to make. I have a long list of projects I want to tackle in 2017, including Smitten (English paper piecing), some placemats for my kitchen and a frw row by row kits, plus some locker hooked rugs and a denim quilt. I plan to finish a bed quilt for myself! I haven’t made myself anything really since I started quilting. Planning on finishing up my personal projects now the holiday gifts are over! I just end to stop giving myself so much to do. My little ones also love the crochet beanie! Lots planned, need to finish my mashup quilt, and I am doing one along with that using Christmas fabric. I also started making doll cloths for the Wellie Wishers. i have 6 small granddaughters and buying outfits for these dolls are just too expensive. I will be quilting baby blankets along the way. So much fun! I just started quilting and want to make a Bargello quilt. I would like to find the time and sew. My days seemed filled with stuff and no sew time. Finishing an engagement quilt for my son, a quilt for my last child, then a quilt for my husband. He has waited so patiently for his personal quilt. I plan on making a quilt for my hubby, to keep him warm at the beach and one for each of my three nieces and one for my nephew. I plan on making some pouches, pillowcases, and a quilt or two. Making quilts for my 4 sisters. This year. I’m planning to finish my flying geese quilt! This next year I will be making my first quilts for my nieces and nephew! I’m very excited and have been getting the fabrics! I’m in recovery from major surgery and need to finish what I’ve started in 2016, my first ever quilt. When that’s done I’ve got the Pokemon fabric all lined up for a quilt for my eldest son who’s 22 yrs old. I’ve planned this quilt in tumbling blocks… (for completion before he’s 23!). The deadline is 10 months and counting! Hello I’m continuing with making Baby Charity Quilts-my passion! Also will be making quilted bags, a crochet caddy, maybe some cosmetic pouches for gifts too! Thank You for your Blog+Giveaway! I hope to fmq my first quilt from 2015 and finish a winter themed quilt with a beautiful reindeer center panel. Complete a quilt that I have been asked to teach a class. Also a new baby arrives in July so definitely a quilt there. I made a Sew Sweetness Rockstar bag for one of my daughters for Christmas, and now two of my sisters want one too. So that’s the first project. I also want to do two quilts for charity raffles, and a a Weekender bag for myself. Thanks for the great giveaway, and congratulations on your following. I’m so sorry that you have to rebuild all your files! Planning to make my 2nd ever quilt – a bear/pine tree wall hanging for our cabin. Beautiful colors ! Would make a lovely quilt. My goal for 2017 is to start and complete 3 fun quilts for my adult children. I just completed a course in machine quilting and I’m totally hooked. The QAL class has given me back my sewing spirit. I must finish my daughter’s kaleidoscope quilt & my son/daughter-in-law’s quilt before moving on to a new quilt after the QAL quilt is done. I want to make minecraft quilts for my boys. Minimal difficulty, big payback! Would like to make a quilt for my best friend. Haven’t decided on a pattern yet. I am in the process of making a jelly roll race quilt for myself. And next year I want to attempt my first t-shirt quilt! I plan on making new pillows for my couch! I hope to make a Christmas quilt for my new grandson! I am starting now for christmas gofts for next year! Make up bags, christmas quilts, and table runners! Planning on making a flying goose quilt with the help of your tutorials. I am new sewer and want to try to make a quilt so bad. I would love to win these to start a beautiful blanket. I am a very early quilter. I am looking forward to completing an underground railroad/civil war sampler. I am so excited to work on this project! I have been watching your quilting videos and I’m ready to give it a whirl!!! Get some personalized stockings for next year. Quilts for kiddos. Some clothes! I’m determined to make my family homemade quilted stockings! I am going to try and finish all my quilts that I started. I made an ironing board over year ago from you tutorial and now thinking it needs an update 🙂 I am also planning on starting my next year’s presents early with oven mitts, towels that hang on the over and some other essentials. Thank you so much, Melanie for all of your awesome tutorials! I love that fabric! This year, i am going to make a paper pieced quilt or two. I have 2 king size quilt kits I want to make next year. I’m making more quilts. I made 18 of your casserole carriers for Christmas this year! I want to do a quilt sampler and make a quilt for my toddler’s bed as well as finish the flying geese. I’m going to make the O’ Christmas Tree quilt from Material Girl Quilts for over my mantle next Christmas. Also, a giant star baby quilt (starting tomorrow) for baby boy who is on his way in February! I’m brand new to quilting and would love to win this fabric! I hope to make my first quilt in 2017. I have so many beautiful patterns to choose from in all of quilting books I got for Christmas!! I am just learning to sew with the intention of making dresses for my girls. I’m looking to do more pillows, baby toys and begin sewing my own clothes. I’m excited to stay on my first quilt! Your YouTube tutorials were sorry helpful and I feel ready to start sewing!! Lots of baby quilts, 4 to be exact! My dream is to open up my own Etsy shop so I will probably be making lots of product for it! Beautiful fabric, thanks for the opportunity! 2017 will be full of quilt making! I will be sewing costumes and I want to do some quilts with a few different star blocks. I’m looking forward to making some aprons! One for my mother in law and sister in law and best friend. So excited!!! So sorry that your site was hacked! You work so hard to share your crafty hints and teach others the love of crafting. 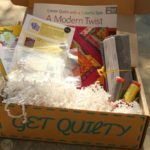 I am looking forward to practicing my free motion quilting more in 2017. I want to expand my designs. Also looking forward to maybe trying a crochet project if I get brave enough. I will be working on a Peanuts quilt for my sister. When my mom passed away, she left a lot of 4.5″ squares behind and I started sewing them, but have to actually learn how to complete this type of quilt. I’m not sure what other projects I want to tackle this year, although my Pinterest folder with ideas is bursting! My goals for the new year is to finish making my husbands memory quilt out of his fathers shirts, also finish quilting two children’s quilts and donate them, then start making Christmas 🎄 Birthday 🎉 and Baby 👼🏼 gifts early! I am excited to work with knits in 2017! I got a serger for my birthday last week and ordered some fabric to make my daughter and I some matching leggings!! I will be making a quilt for a new Grandbaby due in July. Also doing a red white and blue quilt of the Month at my local quilt shop. Thanks for all your motivational videos and blogs! Baby quilt for new grand baby due in July! I will be working on many quilts using my Japanese fabric. I want to finish the quilt from the quilt along too. I also hope to improve my crocheting skills. I am going to perfect my chrocet and make more items! I love your videos that’s how I learned! I plan on signing up for the molders 9 square quilt. I’m not sure what seeing projects I will have this coming year. I just got a sewing machine for Christmas so I need to learn how to sew now! I bought myself Farm Girl Vintage from a Bee in my bonnet for a Christmas present and am working on the sampler blocks now. We’ll see how many of the quilts I can complete in 2017! I want to make quilts and more clothes this next year! I have spent this year learning and next year I want actually make more of these things. I plan on making my son a weighted blanket, finish his bed quilt that I started, and make my mom a quilt for Mother’s Day. After that will be Christmas gift sewing! I know I will be making my friend a quilt for her first baby, due in June! I made my first queen size quilt for a Christmas gift this year and it was a huge hit, so I will probably be making another for someone next Christmas as well! I may even make a new spread for myself, too! I hope to sew more and make another quilt … I also enjoy your tutorials.. I just got a sewing machine. I’m planning to start simply with some napkins before I jump into full on quilting. Many slightly slouchy beanies! and super easy beginner scarf. And I will attempt my first quilt this year!!! I want to finish a hexi quilt I started but never finished. I plan on finishing a quilt for my son and starting another one for my daughter! My great nephew is turning one so I am making him a quilt. Also my daughter wants me to make a tshirt quilt out of the tshirts she has saved growing up. :). I was just given my first sewing machine, and I want to make a t-shirt quilt, but I still need more practice first. For 2017, I plan to watch some of your beginner sewing videos (I’ve done many of your crochet projects in the past) and do projects from those. I’m looking forward to making my first quilt in 2017. I made my daughter a doll for Christmas. I’d like to make it a friend. My plan is to use your tutorials to make my first quilt, finally!!! I’m planning on making a patriotic themed wall hanging for my dining room. It will be my first real sewing project! I plan on making a small quilt. It will be my first one. I’m a little scared but excited at the same time. I have a Christmas quilt that I would love to have finished for Christmas 2017!!! Lol! Love this fabric. I just finished my first sewing and quilting project. It was a gift to my sister. Now I’m making ur roll up make up bag actually. It’s going tobe a gift to my mom. Also have a sleepy baby in the works as well. We just bought our house and I would love to make a ton of handmade items in 2017. Made my Christmas napkins and they were a hit! I’m planning on making a String Along Quilt using scraps! Learning how to sew! Hubby got me a sewing machine for Christmas, so once my baby is a little older I plan on learning how. learned how to crochet via YouTube last year, so I figured why not try sewing. A ribbon star quilt with my quilt group. My first project of 2017 will be a superhero cape for my nephew’s birthday. I picked out the fabrics today. Love your site, especially your tutorials. In 2017, I plan on making several baby quilts for Project Linus. Happy New Year, Melanie! I am finishing a quilt for a friends as a wedding gift…..I have 4 other quilt tops to sandwich and complete…..Then I am making myself a quilt! I have lots of quilts on my list! I am excited to have a Quilter’s Planner to keep track of it all. One of the first may be a baby quilt for my newest grandchild due in August! I’m new to sewing and my next (only my third project) will be mug rugs. I love your posts and videos. Such a wonderful help you are! Working on something for me for once! I just signed up for a class on beginning quilting on Craftsy. So wanted to learn. Wish I paid closer attention when my Mother tried teaching me! I plan on completing the quiltop that you are instructing us how to make. The Quilt along! I also hope to finally work on my first t-shirt quilt. I’ve started on a quilt for my sister that she’s been begging for forever. Hopefully I’ll be able to finish it quickly in the new year. She wants the quilt to have a foot pocket. Hoping to start my first holiday table runner in 2017! Love your video’s, love what you do.